Thousands of visitors come to experience Terry’s cherished oil paintings every year. Now it’s your turn. Immerse yourself in a world that shares treasured stories from rural America. Start planning your visit today. Admission is free. For more information, call 605-882-3877. 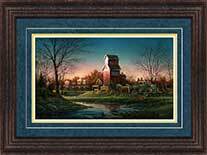 Built in Terry Redlin’s hometown of Watertown, the Redlin Art Center was built by the Redlin family to house his original oil paintings. The Redlin Art Center features many areas where you can learn about Terry Redlin’s work and inspirations. Start planning your visit to the Redlin Art Center with information on directions, hours, admission, tours, discount packages, and Watertown attractions.